After the robbery incident, the driver drove off without waiting to see if the passenger will return. The driver of the commercial vehicle failed to report a robbery incident to the police and now he has been arrested after a passenger's wife failed to hear from her husband in days. Mr Oge Nwanokwai had told his family he would come back when he was leaving home on November 7, but they were not aware he was saying farewell. He had left Ogwashi Uku, the capital of Aniocha South Local Government Area of Delta State and was headed for Agbo where he lives. It is a journey he takes often since his family lives in Ogwashi Uku, but November 7 was his last. 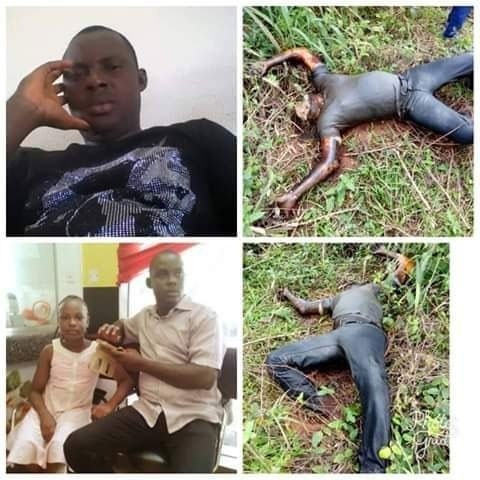 Late Mr Nwanokwai, 34, who is from Ubulu Okiti, under the same local government was a civil servant with Ika South Local Government Area, of Delta state. His four children and wife have now been thrown into mourning, by men suspected to be robbers. On the fateful day, at about 4:30 p.m., the commercial vehicle he boarded was attacked by brutal armed robbers along Obior Ubulu-Uku Road, few meters Ajidua Aluminum company. He was followed to the park where he boarded the vehicle by his wife and she took note of the vehicle that he boarded. When she failed to hear from him days after he left, she reported to the police and the driver of the vehicle he boarded was arrested. After the driver of the 14-sitter commercial bus was arrested, he told the police that armed robbers attacked them, a report he failed to make after the incident. He then took the police to the location and a search for the man began. Few meters away from the road, his already decomposing body was found. Narrating their ordeal to the police, the driver said the suspected robbers ran out of the bush and were shooting sporadically. He was forced to stop his vehicle and the robbers took Mr Nwanokwai passenger into the bush. "All we were hearing was, 'give me my money, give me my money,'" he said. According to him, the sound of a gunshot was also heard before they left the scene. The police said investigation into the incident is still ongoing while the driver is still in their custody.